Usage/Application: Ideal for offices, library, etc. Available Price Range: 180-220/Sq. 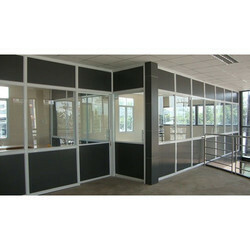 Ft.
We offer Aluminum Office Partition to our clients. 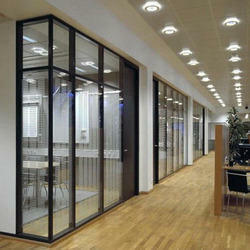 Aluminium partition for commercial and industrial and officce purpose. Wer are the manufacturer for complete aluminium work. Keeping the diverse requirements of customers in mind, we are instrumental in providing Aluminium Partition. We are one of the most reliable companies in this domain and are into offering Aluminium Partition. Being a leading enterprise of this industry, we are offering a huge range of Aluminium Partition. To fulfill the diversified needs of our prestigious patrons, we are highly engaged in providing a wide range of ACP Partition Sheet . Owing to the wide experience of this domain, we are instrumental in offering Aluminium Partition to our clients. We are a most trusted name among the topmost companies in this business, involved in offering Aluminium Partition.